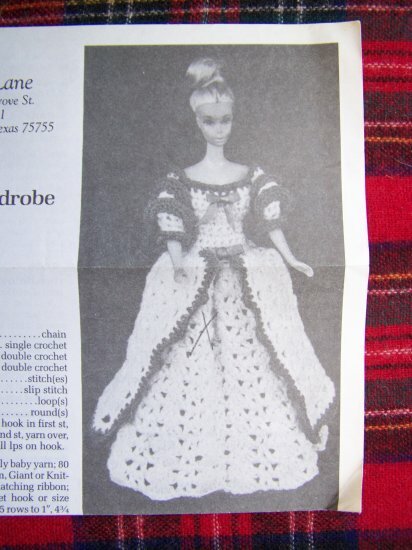 USA 1 Cent Shipping Vintage 1984 Shady Lane crochet pattern for Timeless Fashion Doll Wardrobe for Barbie size dolls. Marie Antoinette. Original black and white pattern # set A. Over 100 vintage doll and clothing for dolls Annie's Attic and other patterns. Inventory box 7. ~~~ Click on pictures to SUPERSIZE and see these beauties up close ~~ Need to see more pictures, just email me! More vintage crochet and other craft back issue magazines, books and patterns listed and more coming..
S & H to the USA is 1 cent folded shipped first class in an envelope! I use Priority flat rate boxes for large orders of magazines etc. S & H to Canada $1.50.